Hi-ho, hi-ho it’s off to Kentucky we go! On Friday, we will be flying to Lexington for a special FEEDback Retreat that our friend Lauren has been organizing for the past several months. We started to tell you about it when we posted the recipe for our bourbon pecan pie upside-down cake, and if you haven’t made it yet, this is the perfect time, since today we are sharing a refreshing cocktail—also made with bourbon—that will accompany that cake like a bow and fiddle. We have been requested to make both recipes at the retreat, and next weekend is already starting to sound like a party. Between bourbon tastings at local distilleries and cooking together with our friends in a historic country estate, we are also lending a helping hand to raise awareness for hunger relief. On Saturday morning, we will be working at a school cafeteria to volunteer with the nonprofit Rise Against Hunger to package over 15,000 meals for people in need. The event runs on donations, and our group managed to raise over $4,000, so we’re grateful to everyone that participated to make this a reality. If you live in the Central Kentucky area and would like to join us, we would love to see you! You can register HERE—it’s super easy and takes just a few seconds, and if you’re not in the area, but would still like to donate, click HERE. After the meal-packing event, we will be celebrating with a home-cooked FEEDback Dinner at the house with our friends Lyndsey Eden and Hayley from Birch & Berries. Lauren has been so thoughtful planning the details of this trip, and wants to include our audience in all the fun. We would love for you to cook along with us, so below we are sharing the recipes that everyone will be preparing at the dinner. If you make any of them and post a photo with the hashtag #FEEDbackDinner2018 on Instagram, you will be entered to win some prizes (see below), and more importantly, you will be a part of our greater effort to raise awareness for hunger relief. Also, she will be compiling all the dinner recipes and turning them into a special commemorative e-book to sell, with the profits being donated to hunger relief organizations. 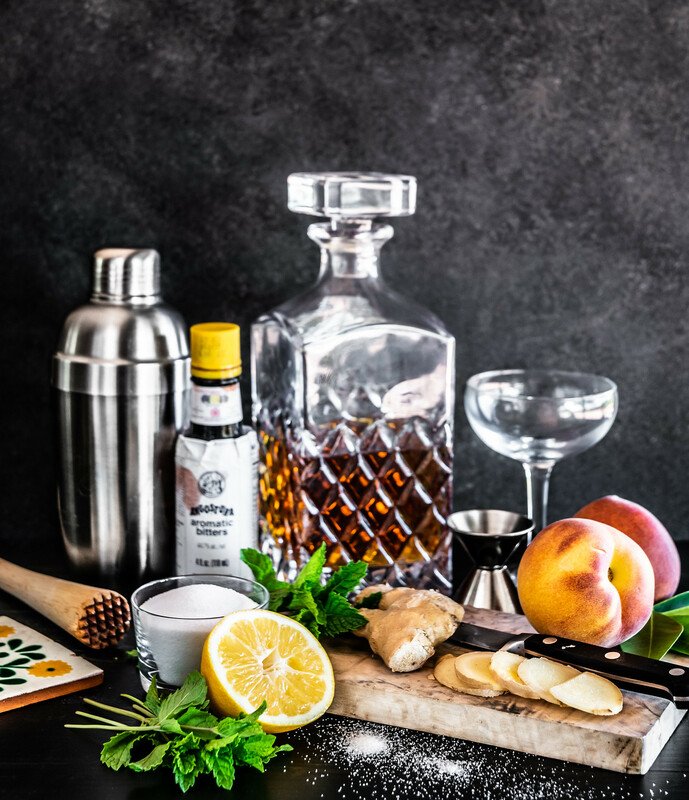 We would love to see you cook along with us and share these recipes with others—as Lauren mentioned, “this is all about community, inclusivity, and raising awareness for an important cause.” And while we’re on the topic of importance, let us fill you in on this golden cocktail which is quite significant, indeed terrific, and outright delicious. Inspired by our upcoming adventures in the Bluegrass State, we created a lively drink we are calling a Lexington Smash. 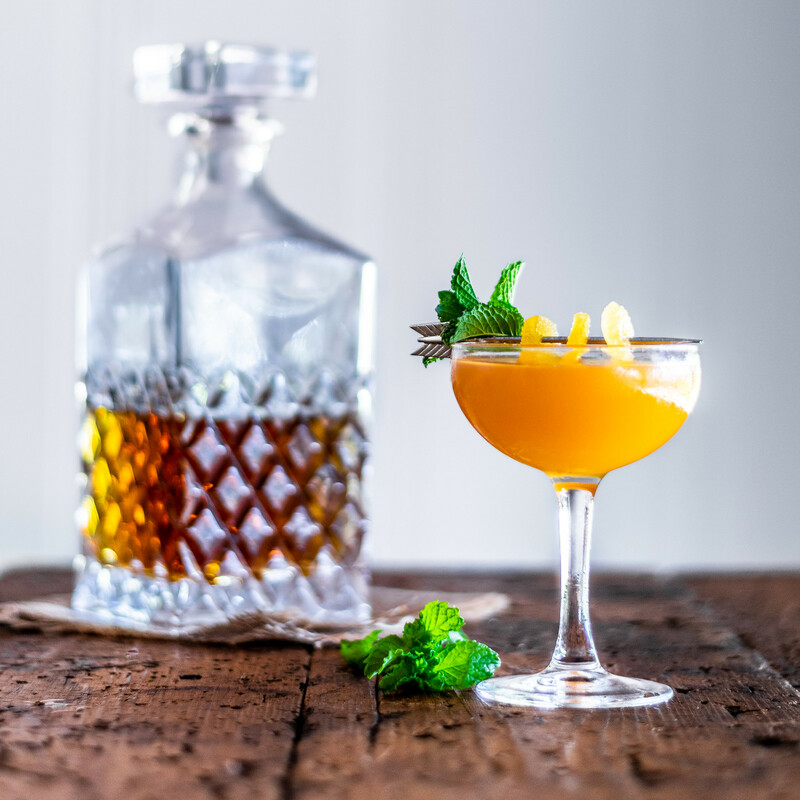 For those of you inquiring, a smash cocktail consists of a spirit, muddled fruit and herbs, and a sweetener—and ours will have you clogging to Bill Monroe with the first taste. In this easy recipe, fresh seasonal peaches are muddled with mint, ginger, and lemon juice, glowing like a ray of southern sunshine. 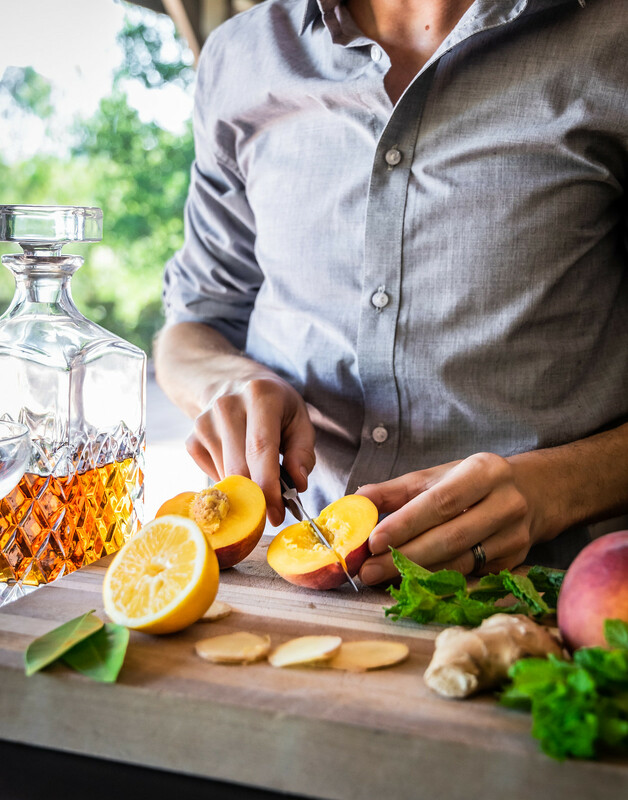 Mixed with your favorite bourbon, a dash of angostura bitters, and garnished with candied ginger and fresh mint, your summer sipping situation is swiftly solved. Follow along our Instagram Stories next weekend as we sample allll the bourbon and take you deep into the heart of Kentucky. Pour yourself an icy cocktail, cook up one of the tasty dishes from the FEEDback menu, and we’ll see y’all next week. Cheers! In a cocktail shaker, muddle the ginger slices until crushed and juicy. Add the mint leaves and peach half, and continue muddling until crushed. Add the bourbon, lemon, simple syrup, and bitters, then fill the shaker with ice and shake vigorously for 15 seconds. 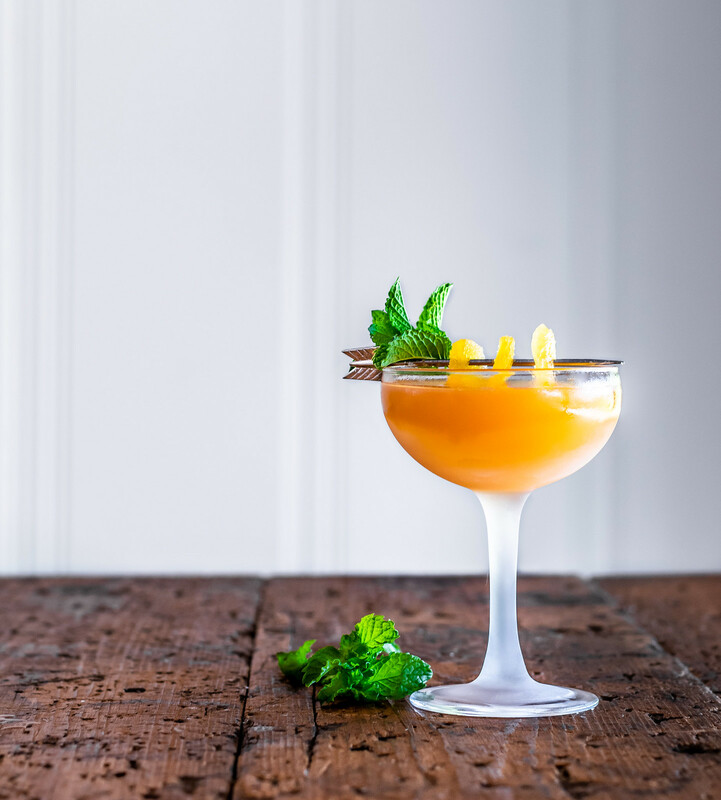 Strain into a chilled coupe glass and garnish with candied ginger and mint leaves. Cheers! — Simple syrup can be made by combining equal parts water and granulated sugar in a small saucepan over medium-low heat, and stirring until the sugar dissolves. Let cool completely, and transfer to a sealed container in the fridge until ready to use. If you’re in a hurry, you can make a quick simple syrup by combining the sugar and water in a small jar and stirring or shaking vigorously until the sugar dissolves.